Thank you for stopping by to see our daily NSD challenge on our blog! We hope these challenges will inspire you to scrapbook throughout this week. For each daily challenge you participate in you'll earn one chance to win (Participate 1 day, earn one chance to win. Participate 2 days, earn 2 chances to win. The more you participate, the bigger your chances to win!). We will draw one winner for a $100 embellishment grab bag. On May 11th we'll announce the lucky winner. To be entered into the daily drawing, post your layout to your online scrapbooking forum of choice, mention the Citrus Twist Kit challenge in your layout write up, then pop back to the Citrus Twist challenge blog you based your project on and leave a comment. Don't forget to visit the CTK Store to see new items, sale items and NSD grab bags! Thinking about subscribing to our Main or Pocket Life kits? We have a special offer for those new subscriptions between now and May 7th. 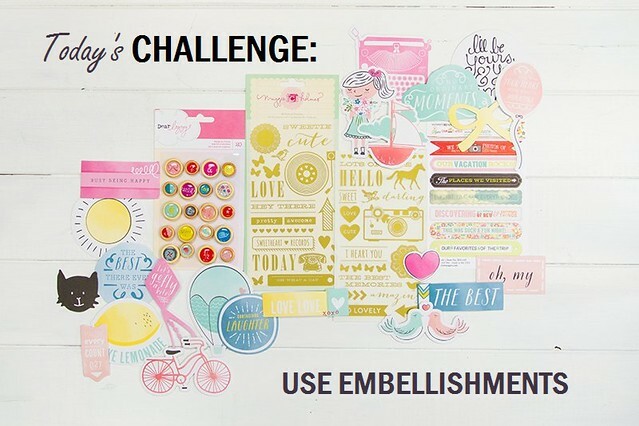 Today I'm challenging you to : Use Embellishments. Super easy right ? From brads to buttons, chipboards to enamel dots, washi tape to ribbons; any type of embellishment is fine. Just pick your favourites and show them off on a layout. The more the merrier so don't be afraid to pile them on. My challenge is inspired by the awesome selection of embellishments in this month's Citrus Twist Kits. There are must-haves in each and every kit, which is saying something for a paper-lover like me. 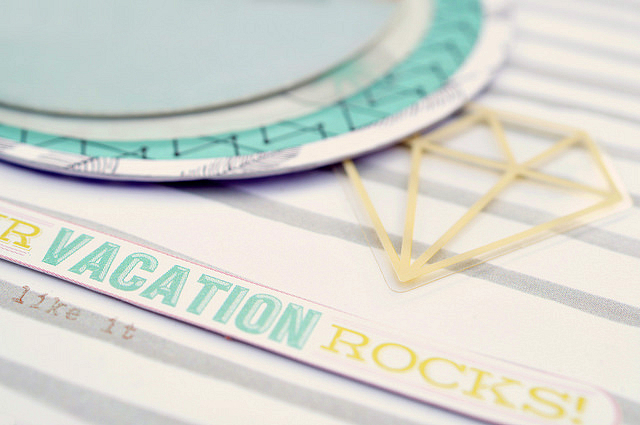 I've used something from each of the kit starting with a whole bunch of die-cut shapes on this vacation layout. Mixing translucent vellum and acrylic pieces from two different ephemera packs allows me to retain a feeling of lightness while layering. There are also rub-ons, label stickers and my absolute favourite - Simple Stories Photo Stickers. They go on totally clear and, if you are indecisive like me, you can easily reposition them without leaving behind any residue on your photo. That's neat ! Here are some tips for working with vellum and acrylic. For an even softer look, try flipping your shapes to the reverse side. To secure, you can tuck them partially under other layers to hide the adhesive, use a stapler or stitch them on with some embroidery thread. Hope you have fun with this challenge and don't forget to keep coming back all week to check out what the other designers have in store for you. 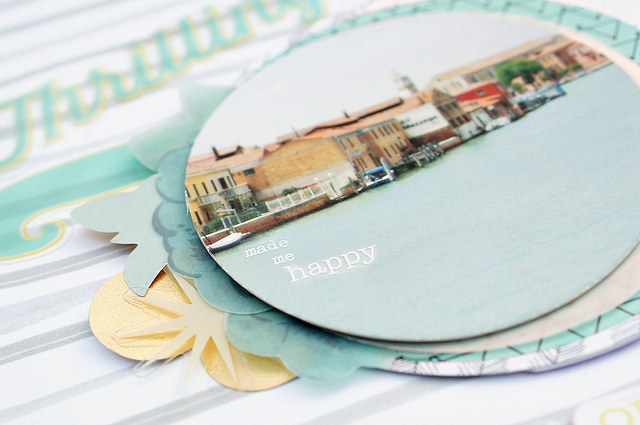 Wishing everyone a very Happy National Scrapbooking Week ! What a beautiful page Sandy! I love the layering under the circle photo and the lightness of the ensemble. totally fantastic the colour blocking on your page ! Here's my take on the challenge. Thanks for the inspiration. Wow Diana! Love all the metallic embellishments you used. It was really a great inspiration for me , so thanks so much ! Totally brilliant the way you used that gold ribbon. Love your page to bits !